Eyes were opened and hearts touched as students in a WSU Tri‑Cities psychology statistics course recently worked with homeless people at Tri‑City Union Gospel Mission. The students spent the semester analyzing data from the facility. determining factors that influence or relate to homelessness. Tri‑City Union Gospel Mission, in turn, can use the data to demonstrate to donors the need for its services, and educate the community. The class also spent a day volunteering at the homeless shelter — cleaning bathrooms, organizing the food pantry, scrubbing floors, folding laundry and decorating their sidewalks with sidewalk chalk, among other tasks. For some students, the opportunity proved deeply personal. WSU psychology statistics students present data on homelessness gathered at Tri‑City Union Gospel Mission. Approximately 34 percent of the residents at the mission had been living with friends or family and, for whatever reason, it didn’t work out. Approximately 21 percent of the residents had been kicked out of their home. Approximately 14 percent of the residents had suffered from domestic violence. The average amount of days stayed at the facility over the course of three years was just over a month (37 days) – a surprise to many of the students. And the leading cause for longer stays in the shelter was eviction, followed by domestic violence. Drug use wasn’t as high of a determining of a factor as many of the students initially predicted. In their analyses, they found that a history of addiction was not related to how long the women stayed at the shelter. Level of education, many said, was also surprising when determining if that had an impact on length of stay. High school graduates typically stayed slightly longer – 43 days, as compared to non‑high school grads, who stayed for an average of 29 days. While all the information was self‑reported and dependent on the individual’s honesty, it proved to break stereotypes on homelessness for many of the students. For junior psychology major Rocio Marquez, it was surprising to find that employed individuals didn’t seem to have an easier path. Employed individuals, she said, might stay just as long as non‑employed individuals. “You would think that because they’re employed, they will get back on their feet much faster, and they don’t,” she said. Junior Sarah Wright said the project has allowed her and her classmates to better understand the Tri‑Cities community as a whole. With former experience being homeless, himself, Hafen said often times, there are no easy explanations or answers to the issue of homelessness ― a concept that many of the students said they came to realize. 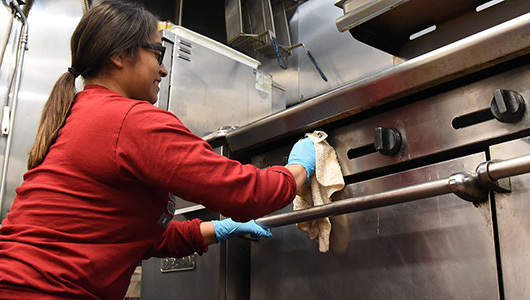 Top photo: A WSU Tri-Cities psychology statistics student volunteers her time to clean the kitchen at the Tri-City Union Gospel Mission in Pasco, Wash.